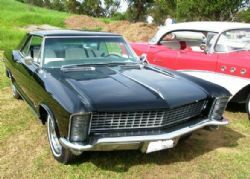 Last Sunday I headed off to American Car Sunday, held at Rat Park, Warriewood on Sydney’s Northern Beaches. This is the closest event to my house and one I look forward to each year as it normally has a good array of classics, rods, customs and numerous vendors selling everything from books to parts for the local enthusiasts. The weather forecast wasn’t too brilliant but that didn’t stop the sun shining and the accompanying humidity make you feel like you were in far north Queensland. This event has been running for a number of years and each year seemed to get bigger and better so expectations were high as I fired up the corvette and headed off. 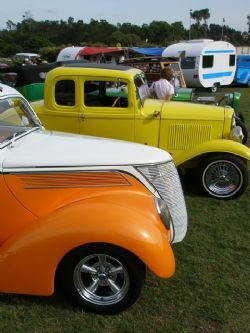 The format was the same as last years – owners showing their cars were asked for a gold coin donation and the general public was hit up for an $8 entry fee or $15 for a family. All proceeds were going to local charities and there were plenty of trophies up for grabs. I didn’t have all day so I parked the corvette outside, paid the entry fee and strolled in to check out the action. Most of the cars on show have attended for the last few years and you had to look hard to find anything you hadn’t seen before. Corvettes, Mopars and Mustangs had the largest presence and were parked out on the oval and the Thunderbird, Cadillac and Chevy clubs had a handful of members attend as well. 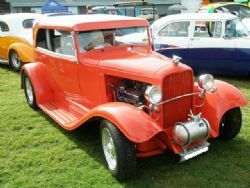 The usual high quality rods from the local northern beaches club were there as well as a number of enthusiasts that were not associated with any club. 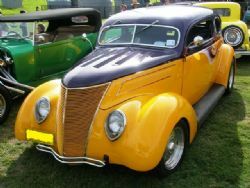 As experienced in previous years the quality of the classics, customs and rods was top shelf and a few original beaters sporting their aged patina provided a great contrast to lovingly restored pristine vehicles. NRMA Classic, Veteran and Vintage Insurance were the sponsors and they had a tent and staff on site that seemed to be well patronised. Unlike previous years the other vendors stayed away and the choice included two coffee vans, one magazine/book seller, a Shannons tent and another vendor selling retro prints of VW Kombi vans and the like. Very sad. After an hour I was done and dusted and managed to eke out a few conversations to drag my total time at the show to an hour and half. It also took me ten minutes to get the dirt out of my thongs as the landlord had just top dressed the oval which mixed with a good nights dew stuck like the proverbial to anything it contacted. I always try to look for the positive and this show offered quality vehicles but sadly not much else. The organisers will have to get their act together for next year or I suspect jaded punters like myself may vote with their feet and not bother to attend.